The Colorado cannabis industry has quickly gone from bud to full flower, as indicated by a new in-depth data analysis by the Marijuana Policy Group. Using a new “Marijuana Impact Model” they say is the first to “accurately characterize how this industry impacts the overall state economy,” the researchers confirmed the astounding positive impact that legalization has brought upon Colorado. Legal cannabis activities generated an output of $2.39 billion in 2015, with almost $1 billion in sales for the year. The sales represent a 42.4 percent increase from the previous year, translating into a staggering 112 metric tons of buds and 132 metric tons of “flower-equivalent” products (edibles, concentrates, etc.). Cannabis now ranks number six in terms of product sales, following closely behind cigarette sales. It beats gold mining by a large margin, and even performing arts and sports venues as well as all non-grain crop farming. However, the real impact is seen when put in terms of “output and employment per dollar spent,” where spending in the cannabis industry outperforms all private industries in Colorado – including coal and other mining, oil and gas, casinos, business services, general manufacturing and retail trade (incl. alcohol). 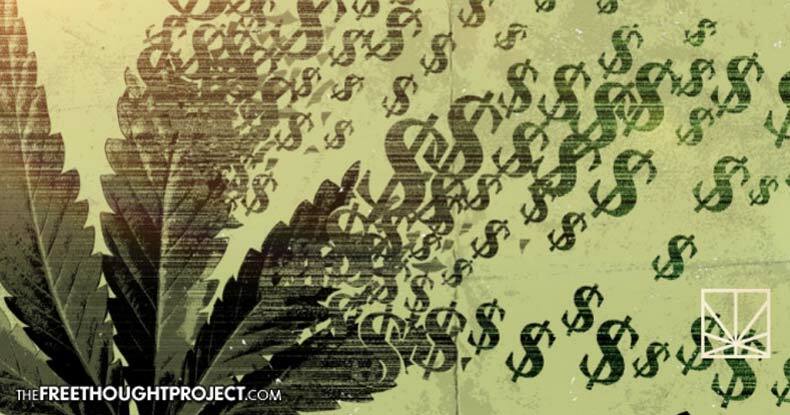 Each dollar spent on retail cannabis generates $2.40 in state output, while cannabis manufacturing follows with $2.34 and cannabis cultivation comes in at a close $2.13. Combining the three, cannabis is generating far more than any other entity, including federal government spending. Much of this has to do with the fact that the Colorado cannabis industry operates almost entirely within the state, due to continuing prohibition in other states. There is equally impressive news in the jobs sector, where legal cannabis created more than 18,000 jobs in a year. Security guards comprise a significant portion of these indirect jobs, due in large part to the fact that the industry is still being forced to operate on a cash basis — because of asinine banking prohibitions by the federal government and the Federal Reserve. This isn’t stopping entrepreneurs and other productive individuals from taking advantage of the new, wildly popular market. Legal cannabis is having profound effects in many other industries, including commercial real estate, construction, and a raft of business services. The cannabis industry itself is growing at a faster pace than any other sector, at an astonishing 42.4 percent. Colorado’s general economic growth is at 3.5 percent and the U.S. average is 1.75 percent. The growth analysis found a very interesting result that supports a primary argument for ending prohibition. 36.2 percent of the economic growth was the result of the disappearance of the black market. When people are free to indulge in the personal behavior of ingesting a substance – as they can with alcohol – they will naturally choose to do so through the legal market, even if it means having to pay exorbitant taxes. And Colorado is gladly raking in this tax revenue. “In 2015, marijuana taxes were the second largest revenue source among excise products in the state (e.g., tobacco, alcohol, and gaming). The huge increase in tax revenue is primarily caused by the rapid increase in recreational use sales since legalization in 2014, and the fact that recreational products are taxed at a much higher rate than medical cannabis products. Interestingly, the report noted that a significant portion of the cannabis industry growth is coming from visitors who go to Colorado on cannabis vacations, rather than some other reason like skiing or hiking. If there is one negative aspect to the report, it is that small cannabusinesses are struggling to stay alive as the industry becomes dominated by larger companies. While some of this is the natural result of competition, it appears that many of them are being regulated out of business by the state. There lies the hidden barb of legalization. There’s no question that ending prohibition is the right thing to do, but government tends to place needless, cumbersome burdens on free enterprise which favors larger conglomerates and smothers the little guy. This ultimately leads to less competition and the tendency for monopolies to develop, which makes it easier for government to siphon their taxes. All in all, though, the analysis by the Marijuana Policy Group is heartening, and it shows other states how incredibly beneficial it is when people regain freedom and a new market is born. The report is especially timely, as nine states will be voting in less than a week to expand legal access to cannabis through recreational and medicinal means.